Coca-Cola Freestyle, the beverage dispensing machine by Coca-Cola that offers up to 100 soft drink varieties, hosted a pop-up in London over the weekend. The World of Choice pop-up opened its doors from 4pm through to 7pm on both Friday (9 October) and Saturday (10 October) at Greek Street in Soho. It was designed to showcase the different flavours that the branded machine offers. Those who attended the pop-up were invited to take advantage of its unlimited beverage offer, mixing and matching flavours including Coca-Cola, Dr Pepper, Fanta, Schweppes Ginger Ale and Powerade to arrive at their desired combination. 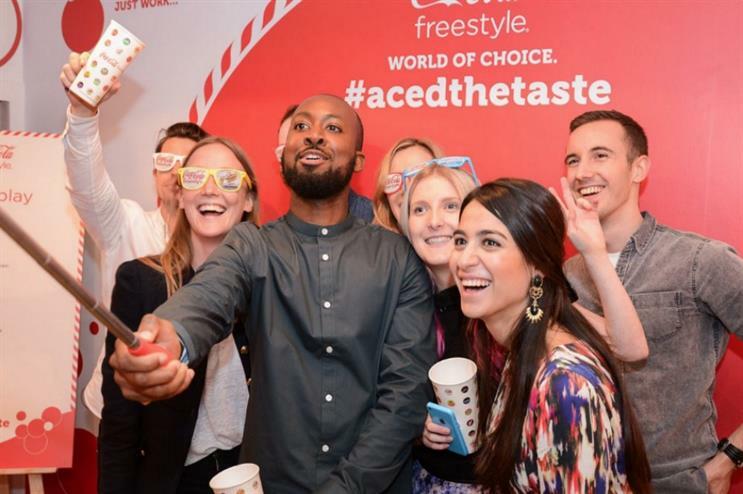 They were required to download the Coca-Cola Freestyle app in order to gain entry to the space, which showcased the dispensing machines as well as Coca-Cola Freestyle branded paraphernalia including cups and sunglasses, which attendees could don as they captured photographs using selfie sticks. Coca-Cola planted a Twitter-powered vending machine within London's Waterloo station in August, enabling passers-by to receive a free t-shirt by tweeting their favourite Coca-Cola variety. More recently, the brand has been handing out free Rugby World Cup tickets from a branded taxi in London, and it is lighting up the London Eye throughout the tournament.